Throughout your stay, monuments and buildings dedicated to Krakow's most famous son will be inescapable, so what better way to begin your initiation than by touching down on the runway of John Paul II International Airport. Recent expansion and renovation of the former military airbase has increased the annual capacity of passengers to over 3 million. With tourism continuing to rise and Krakow becoming increasing important commercially and economically, this number will continue to grow. Info Desk Can't miss it, slap bang in the middle of the main terminal. All English speakers to boot. Mother and baby Open 24/7 and found on the upper floor of the terminal. Free of charge. Chapel Say a pre-flight prayer or attend Mass on Sunday (10am). Mezzanine. First Aid Ground floor of the terminal area should you need it. Cash Two bureaus de change, a Polish bank and a cash machine await you at arrivals for all your monetary needs. Post Office Run out of stamps and still have postcards to send? Don't worry, the post office is on hand Monday - Friday, 8:45am - 2:45pm. Tickets Further trips planned or made a boo-boo with your e-ticket? The ticket office is located alongside the bank, change bureaus and car rental outlets. Executive Lounge Feel like being pampered? Foreign newspapers and magazines as well as serve-service buffet are on hand in a luxury environment all for little more than a tenner. Internet connections and foreign TV channels provide a home away from home. Food and Drink No McDonald's or Starbucks, but a handful of snack bars and cafes on both floors as well as an outdoor caf during the summer months. In a rush? Various vending machines will happily eat up the last of your Polish shrapnel. Once you're through passport control, there are more cafs on hand should a frisking reveal a previously undiscovered wad of Polish zloty. Shops Whether it be reading material, Polish-themed souvenirs, alcohol or jewellery, shops on the upper floor of the passenger terminal are ready and waiting to relieve you of any remaining zloty. Didn't buy enough amber or vodka while in Krakow? Think of this as last chance saloon. Duty Free Located after ticket/passport control, have your boarding card at the ready to take advantage of cheap cosmetics, alcohol, sweets and souvenirs. This really is your last chance. Travel Agencies On hand if necessary but the smart and savvy will know Cracow Life already has the answers! Rent a car Can't miss these guys. All your international friends plus their Polish counterparts are waiting by arrivals in the main terminal. Parking Should you need it, you'll pay 5 PLN (1, $1.25) for cars per hour on short stay, longer stay works out at 40 PLN for days 1-2, 20 PLN thereafter. BUS Cheap, cheerful and by no means a bad option, MKS provides a frequent bus service from the airport to the city centre. The bus stop is just to the right on exiting the airport and tickets are available either from the ticket machine (2.50 PLN) next to the information point in the passenger terminal or on board (3 PLN). Be aware that if you have any baggage larger than a rucksack, you'll be expected to purchase an additional ticket for this. Stamp tickets immediately after boarding to avoid fines. The 192 service runs approximately every 20 minutes from 4:45am to just after 11pm. Alight at the main station, Dworec Glowny, where you'll find maps, info points, public transport connections and you'll be a mere 5 minutes walk from the main square. An alternative 208 service runs slightly less frequently though this is for those staying near to the Nowy Kleparz district. For both services, it's worth remembering that these services are not exclusive airport services and are normally pretty packed by about the halfway point of the journey. Journey time 25-35 minutes. Check out the MPK website for exact times and routes. If you're looking to take the hassle out of the final leg of your journey or don't fancy being taken for a less pleasant ride, why not use our Krakow taxi transfer service and we'll take care of it! For 70 zloty we'll put your name on a board, wait for you at arrivals and take care of your baggage for you - the stress-free way to arrive in style. TRAIN Bit of a locomotive enthusiast? A recently opened service connecting the main rail station, Dworec Glowny, with Krakow airport runs approximately every half hour from 4am until midnight. Tickets are available on board for 6 PLN (1.50, 2 Euros). The platform is approximately 200 metres from the passenger terminal though a free shuttle bus is on hand for the weary. Journey time is approx. 15 minutes. Here's some great information about the airport in Warsaw from our top sister site, Warsaw Life. Hopefully your plane won't get diverted due to fog or snow, but just in case, you can find out a lot more about other airports in major Polish cities on our sister sites, including Wroclaw Airport and Gdansk Airport. I was in Krakow 40 days ago, but i can't go to the the tax free office, how long does my receipt is valid? The easiest way fr.o.m. Krakow Airport to hotel Polski Pod Bialym Orlem ? Take a train to the city centre, and then walk 7 min on foot, there's really no point in calling a taxi. Good luck! Please be aware by taking polnish money from the Euronet desk in the arrival hall. They will ripp you with very high charges. Better wait to take money in town at different bank wall automates. The taxi costs 100 Zloty to city centre. This was the charge on a Sunday at 9PM too. Don't worry. Very easy. Get the train. It's literally 2 min walk from the airport. The train you get only goes to krakow city centre so you cannot get lost. How you then get to the old town? Probably a taxi is best unless it is not far and you can walk? I miss information about the tourist office at the airport and opening hours if I have to buy Krakow Tourist Card there. If you hang around at the official bus stop. Where the service bus stops. There is usually a couple of guys with a mini-bus taking tourists or polish people into the centre. They drop you off at the shopping centre. Which is basically where the train stops. Very friendly guys and cheaper and quicker than the train or service bus. Just to add the cost of the train is now officially 12 zloty per person. Still much cheaper than a taxi! We just took the express train with mule-speed and the conductor took 24 pln for us two which is double the normal taxt, small bags on our laps...on the ticket it stated 2 people, nothing more!!! Ripped off! Hi Pat, No departure tax is charged at the airport. As you say, it has been added already to your ticket price! Spending three night in Krakow April. Do Poland charge departure tax or will this already have been added to airfares? We'll fly from Krakow to Warsaw then onto Italy. Make sure you have 10 zloty (equivalent to 2-50 euros) before you get on the train. If you pay in euros it will be much more expensive. I was asked to pay 4 euros. Thanks for the information. I'm flying out of Krakow to US via Paris. How soon should I be at the airport if the flight is at 7:55am? Whoever will travel to Krakow Airport AWARE of BUDGET rent a car company!!! Hello, everybody! Please advise what is fastest and expansive (exept taxi) way from Krakow Airport KRK to Katowice Airport KTW? Thanks in advance. Been 3 times, forget taxi's if you going to kracow, free bus outside front door takes you round to little platform, train only 6 zl straight into kracow non stop then get tram to your hotel great service 2.5 zl any distance. hi i am planning on taking the train from the airport to kracow central with my daughter,can anyone tell me if i have to buy tickets for my luggage as well? 120zl. from airport to hotel??? HUGE RIPOFF. Thats $40..Take the train from airport to center of Krakow 6zl or the bus..Alot of POLISH CONARTIST TAXI DRIVERS in Poland,they charge you three times the rate or more..ONLY get registered taxi driver..
Is it safe to store luggage at the airport? if so, do they accomodate any size? is 120zloty a good rate for transport from airport to city centre hotel? is 120zlotyz for aushwitz good? salt mine 120zloty good? Thank you. Taxi is the most expensive way from the airport to Old Town. Take the bus OR walk the short distance from the terminal to the train and it is quick, cheap and efficient. Can easily handle your party of 28 unless there are ridiculous amounts of luggage. How much to hire a bus to collect 28 people from Airport and take us to our apartments in the old town? Also need a quote for return journey. I know there s public bus and tain but I want to keep us all together. I have e mail main taxi address but no reply yet. Any tips or sugestions welcome. Hi, Pauline. Taxi is your best bet. You can take a bus or the fast train to the main train station and take a taxi from there, but probably just as good to take a taxi in from the airport. how to travel from Krakow to jaslo, who knos it? Hi there, i am travelling to Krakow at the weekend with my 11 month old son. What are the laws on travelling in a car/taxi with a baby as we arent bringing his car seat? Any help appreciated. Can anyone tell me the easiest way to get from Krakow airport to Katowice city centre? Is there a bus or do I have to get a taxi? And do you know how much that might cost? The information about the airport buses is incorrect. The bus lines to the airport are 208 and 292. The link to the MPK website also needs updated. Go to the root and you can find the bus schedules there. This is a great site to know about Krakow :-) Could you tell me what the best (easiest) way to get Sanok from Krakow? According to the Polish state railway site, train to Sanok seems to be available but I'm having trouble with finding the exact name of the station of Sanok and Krakow... Thanks for your help. Is there more than one airport in Krakow? Good info. and well written, cheers Keep up the good work! Waited 10 hours in this airport! We were fogged in at this airport yesterday (23/1) and there was not one flight movement all day. It was horribly managed. Despite some great staff members on the team at the airport, the airport struggled to cope as the waiting lounges were full and no flights were departing. Noone was informed that there was in fac to be no flight movements and they continued checking passengers in, making them wait 4 hours before letting them know the flight was cancelled. This is when incoming flights had already been diverted and completely cancelled. It turned out to be an expensive and very stressful day for us. Wheck the weather for the day of your flight in Autumn and Spring as Fog is really common here and airport staff informed me flights are VERY often delayed at Krakow. Apart from this its a great little airport and the circumstances were extenuating but the situation was poorly managed and for this there's no excuse. It Was A Very Nice Airoport But Was Very Small For The Amount Of People There. We used bus 208 to the City Centre, which was amazingly cheap (3plz each)and from about half way were entertained by a bus load of good humoured football fans singing as if their life depended on it! Great fun - don't waste your Zlotty's on a taxi! This site is so helpful! Thanks so much...love the travel times, ticket purchase, comparisons, etc. Can't wait for my trip in March! I flew into Krakow from Gatwick in April 07 using Central Wings. No problems at all. I collected my luggage within 10 minutes of landing and 10 minutes later I was on my way by taxi to my hotel. I flew from Krakow to Amsterdam (can't remember the name of the airline but it was Polish)early in the morning. Very quick check-in and boarding and a very pleasant flight. The reason for my trip was a trip to Auschwitz. I was a single female traveller and had no problems at all. I caught the bus to Auschwitz and returned the same way. All in all a very pleasant trip. I found the Polish people I spoke to very friendly and helpful and am planning another trip to Auschwitz in March (alone again). I will definately be flying using the Polish airlines as they are cheaper than easyjet, jet2 etc and also much more friendly and welcoming. Don't get me wrong, I'm all for our cheap airlines here in the UK but it still beats me how other countries budget airlines can undercut our cheap airlines by so much (even flying into the UK). I would recommend checking the costs with Polish airlines, I'm sure you'll be very pleasantly surprised by how much you can save. I have been through this airport on about 10 return trips and can confirm it has been rapidly expanded. I usually carry luggage on board BA flights, and have had no problem therefore with delays on arrival. The 192 bus is good FROM the airport but from Krakow it can get packed before it gets very far from the station. So it is not uncommon to stand most of the way back to the airport. The train is preferable only if you are staying right near the Station Krakow Glowny. Looks like Ryanair are closing down some of their routes from Cracow Airport, and may be flying more to Katowice etc etc... I remember Easyjet also stopped flying to Berlin from Cracow, so maybe there's quite a bit of competition from SkyEurope, CentralWings and the like? We came to the airport on Easyjet. Our plane landed first, and we were first into the baggage hall, but then two other planes landed (Alitalia and Lot I think), they came through afterwards but got their bags FIRST! We had to wait over half an hour for our baggage to be delivered. I don't understand. 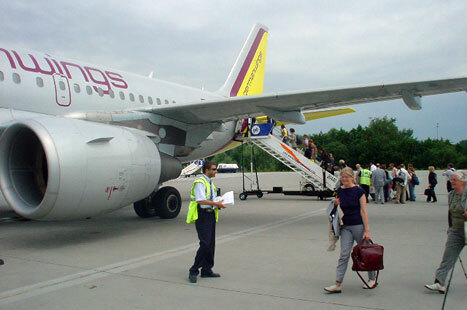 Is Krakow Airport downgrading service to passengers on low-cost airlines? I guess Easyjet pay less for landing rights, so is this standard practice? If so, thos problem could get worse as the airport gets busier! I agree, Cracow airport is not the biggest or the best equipped for the increasing traffic coming it's way. Nonetheless i've had no bad experiences except the odd half hour, or hour delay at worst. I heard there were plans to build a new airport terminal to handle all the extra passengers, but so far I haven't seen any sign of that - anyone have an idea what is going on? It's pandemonium at the airport in the high season!